How to remove Audible DRM? Audible is the home of the world's largest selection of audiobooks. You can only enjoy Audible audiobook on selected devices and players. Because Audible’s AAX and AA audiobooks are protected by DRM protection. It is quite annoying for DRM protected Audible audiobooks owners. How to break the DRM limitation and remove it from Audible audiobooks? We highly recommend Ondesoft Audiobook Converter. Ondesoft Audiobook Converter is the most fast and convenient audiobook converter in the market. This powerful tool adopted an innovation description method that can break Audible DRM protection and convert it to MP3, M4A, AAC, AC3 or other common formats without iTunes. What’s more, you won’t waste almost one day to convert your Audible audiobooks like other audiobook converters. With the help of Ondesoft Audiobook Converter, you could finish the conversion with up to 100X conversion speed. Fast conversion speed, keep all chapter information and other advantages make it the best choice for Audible audiobooks owners. The following tutorial will show you detailed steps to remove DRM from Audible audiobooks. Related: Where to get free audiobooks? The following tutorial will show you how to remove Audible DRM and convert aa/aax audiobooks to mp3 with Ondesoft Audiobook Converter. After launching Ondesoft Audiobook Converter, you will see all audiobooks in your library, so no need to add audiobooks manually. You can choose audiobooks you want to convert by clicking the option box in front of each audiobook. This Audible AA/AAX AudioBook Converter supports batch conversion, so you can select more than one audiobook or all. Click the Options button at the top of the main interface, you will find all the output parameter here, such as converting speed, output filenames, format and so on. Then you can change them as you like. Click the Convert button to start converting audiobooks to MP3 or other DRM-free formats. When the converting is completed, open the output folder to find the DRM-free Audible audiobooks. Ondesoft Audiobook Converter is also capable of converting iTunes M4B/M4P audiobooks to mp3, check this tutorial. Notice: Unregistered users can only convert each audiobook for 3 minutes. However, you can break the limitation by purchasing a full version. How to convert purchased iTunes audio books? How to customize preferences settings? How to convert Audible .AA audiobooks to MP3 on Mac? How to convert iTunes audio books to MP3 on Mac? How to convert audiobooks to AAC format on Mac? How to convert Audiobooks for Android Devices on Mac? How to play audiobooks on portable audio players on Mac? How to rip audio books to MP3 on Mac? What is an M4B File? 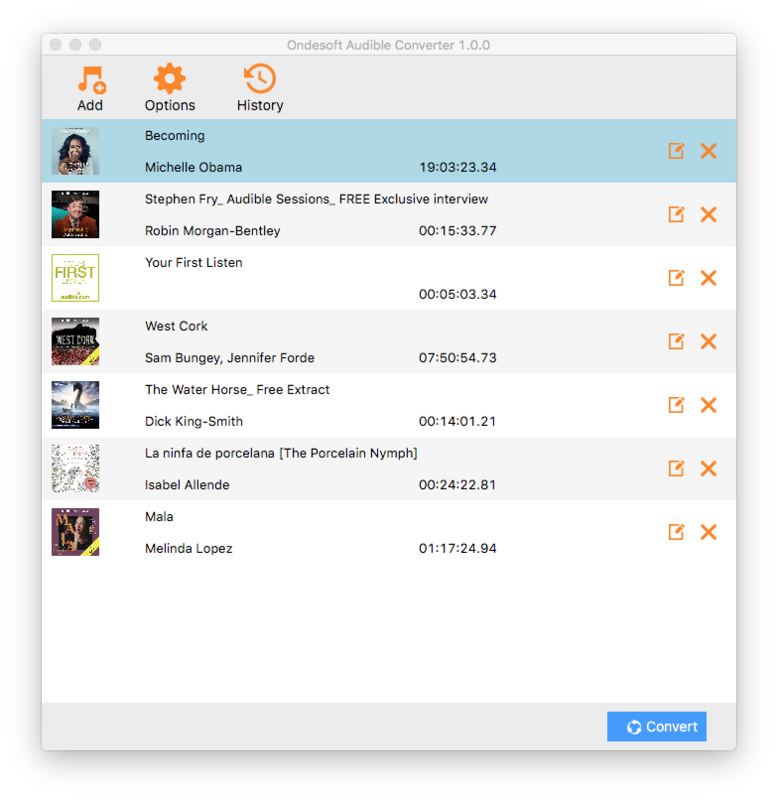 As an audiobook lover, I fell in love with the easiness and possibilities of Ondesoft Audiobook Converter. Now I can enjoy my purchased audiobooks anywhere and anytime, which is really amazing!